The clear opportunity in markets is the value presented by cyclical assets in a world that is growing reasonably well with mild, positive inflation. The clear threat is very highly priced secular growers, especially in tech, and more interestingly in safety – in low volatility/high quality businesses – much beloved by both algorithmic traders and investors seeking havens. The outlook for corporate profit growth into 2019 appears solid, if unspectacular. On the other hand, many equities globally are priced for dire outcomes. The result could be strong performance for cyclical assets in 2019 and beyond. Current consensus earnings expectations in the 20 largest equity markets globally for the next 12 months are for 10 per cent growth1. Consensus expectations may prove too high, but are far from implausible relative to earnings expectations of 11 per cent among companies we own in the Platinum International Fund2. And yet many major markets are trading very cheaply. For instance, South Korea on eight times earnings, China on nine, Germany on 11 and Japan on 123. Leaving aside the abstraction of market multiples, many very good global companies are trading on low valuations. For instance, Samsung on six times, BMW on seven, Daimler on six, Itochu on six, Skyworks Solutions on 10 and Glencore on eight4. Once it was hard to find a stock on 10 times earnings. 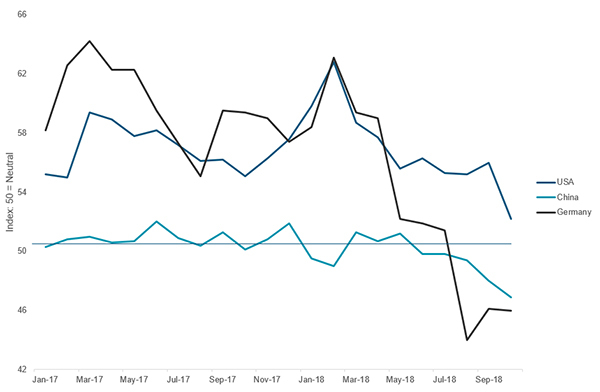 We think there is a significant divergence between investor perception and reality; investors are pricing dire outcomes in the global economy when they are pricing cyclical assets so cheaply. It is entirely possible there will be a continued de-rating of financial assets buoyed by the easy money policies of the past 10 years, such as high-flying tech stocks and high quality/low volatility stocks. The global economy, however, is in reasonable shape, growing at approximately trend rates. Indeed, this is precisely why rates are rising. The result of investor uncertainty, plus passive investing, has been huge outperformance of both tech stocks and high quality/low volatility stocks. While tech stocks such as the FANGs (Facebook, Amazon, Netflix and Google/Alphabet) attract a great deal of commentary, the performance of low volatility/high quality stocks such as Procter & Gamble or Nestle has been remarkable. The share prices of many such companies are at record highs, at earnings multiples well above 20 times. Many such businesses have barely grown operating earnings in five years and have been gearing their balance sheets to buy back stocks. In a rising rate environment, they appear vulnerable. Global growth appears solid, if unspectacular, as we head into 2019. The International Monetary Fund, for instance, expects global GDP growth of 3.7 per cent5, in line with 2018, and this seems realistic to us based on what we can see through our portfolio of companies. 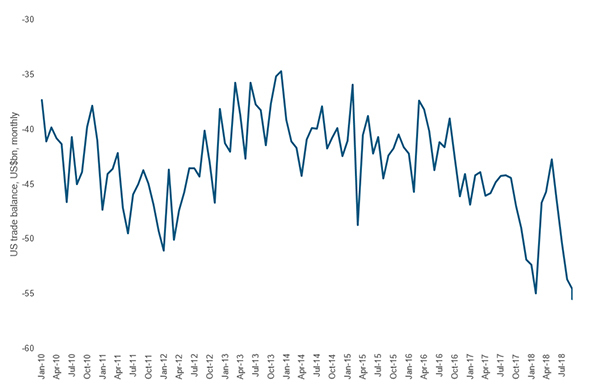 Global manufacturing’s Purchasing Managers Index (PMIs) are indicating ongoing mild expansion, with the November reading coming in at 52. This compares with 50 in 2015, consistent with zero growth. Within this, PMIs in China are at neutral 50 readings, Europe slightly expansionary in the low 50s and the US strong in the mid-50s6. 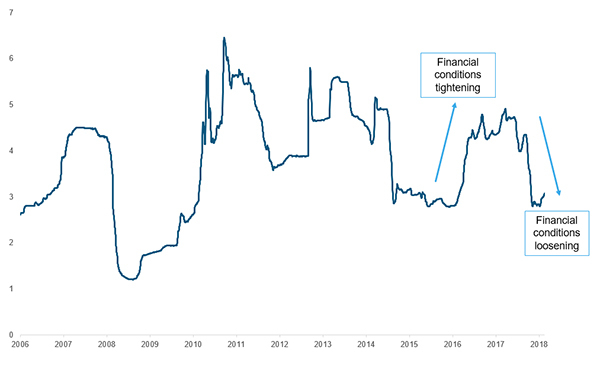 After major tightening of financial conditions in 2017 and 2018, these have recently loosened significantly. The cumulative effect of capacity closure in heavy industry, diminished investment in infrastructure and other fixed assets, plus restrictions on consumer and small-to-medium-enterprises, and the impact of trade disruption has been, in effect, an over-tightening of financial conditions in China in 2018. In response, Chinese authorities have cut reserve requirements in the banking system, lowered effective tax rates for individuals and increased liquidity in the banking system (as indicated in the Shanghai interbank offered rate, or Shibor). One might expect this to lead to increased economic activity in China in coming months. Source: Bloomberg. Data to 23 November 2018. Shibor is the Shanghai interbank offered rate – a short-term interest rate. Simply put, the US is not “winning the trade war”; everyone is losing. The US trade balance has deteriorated over the course of the year and export PMIs have collapsed globally, including in the US. To understand why, imagine you must run supply lines for a firm in Hamburg, Seattle or Guangzhou and you don’t know what tariffs will apply on January 1, 2019. A tough job. Now imagine being the Chief Financial Officer of the same firm. Should you abandon current, highly efficient supply lines in China and invest in capacity in Vietnam, Cambodia or Bangladesh? You don’t know if tariffs are permanent or a bargaining chip that will disappear soon. Another tough job. Perhaps all this is masterful positioning ahead of negotiations, but this stretches credibility in our view. The simpler explanation is that this is politicking. We expect ongoing headlines and market skittishness surrounding trade aggression. We would note this is a headwind for global profit growth, given the long, intricate supply lines of large companies (for instance, one large chipmaker has 16,000 suppliers, according to the Economist). In summary, markets have been made turbulent by trade disputation and macro-economic fears, as well as rising US interest rates. Higher rates argue for lower (PE) multiples on equities and this process has been ongoing over the course of 2018. 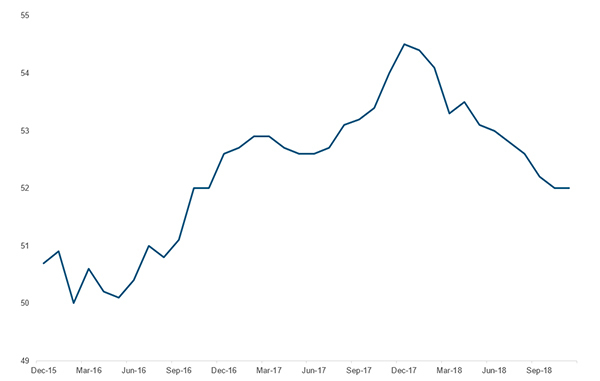 We expect this to continue in 2019, with the tech and safety trade (low volatility/high quality stocks) looking vulnerable. On the other hand, cyclicals usually outperform later in economic cycles, as accelerating growth drags rates higher. We have seen none of this in this cycle, and this may be in prospect given the remarkable value apparent in cyclicals. 1 Source: MSCI, Credit Suisse. At 2 December 2018. 2 Using median FactSet consensus estimates on an annual basis for expected “FY1” (current unreported financial year) and “FY2” (following unreported financial year) net income, we compute the weighted harmonic average for the growth rate from FY1 to FY2 for Platinum International Fund’s positions. Excluding shorts, cash and loss makers. 3 Source: MSCI, Credit Suisse. At 2 December 2018. All multiples on a “next 12 month” basis. 4 Source: FactSet. At 2 December 2018. 6 Bloomberg. PMI is a survey-based measure of activity, with results of 50 indicating neutrality, greater than 50 expansion, and lower than 50 contraction.